In this follow up to The Eudemian Ethics of Aristotle, Peter L. P. Simpson centres his attention on the basics of Aristotelian moral doctrine as found in the Great Ethics: the definition of happiness, the nature and kind of the virtues, pleasure, and friendship. This work's authenticity is disputed, but Simpson argues that all the evidence favours it. 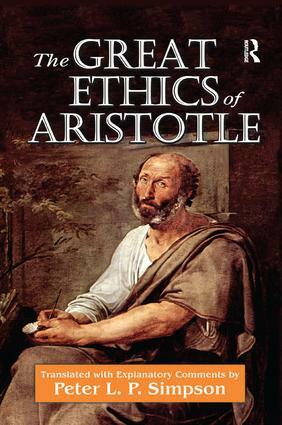 Unlike the Nicomachean and Eudemian Ethics, Aristotle wrote the Great Ethics for a popular audience. It gives us insight less into Aristotle the theoretician than into Aristotle the pedagogue. For this reason, the Great Ethics has distinct advantages as an introduction to Aristotelian ethical thinking: it is simpler and clearer in its argumentation, matters such as the intellectual virtues are made suitably secondary to the practical focus, the moral virtues come through with a pleasing directness, and the work's syllogistic formalism gives it a transparency and accessibility that the other Ethics typically lack. Arius' Epitome, which relies heavily on this work, helps confirm its value and authenticity. Because the Great Ethics is generally neglected by scholars, less has been done to clear up its obscurities or to expose its structure. But to ignore it is to lose another and more instructive way of approaching and appreciating Aristotle's teaching. The translation is prefaced by an analytic outline of the whole, and the several sections of it are prefaced by brief summaries. The commentary supplies fuller descriptions and analyses, sorting out puzzles, removing misunderstandings, and resolving doubts of meaning and intention. This book is a fresh rendition of the work of the preeminent philosopher of all time.